In order to properly test your upsell funnel, you'll have to run an actual live test order using a live credit card. We always recommend the store owner to run through a couple of test orders beforehand so that they know exactly how the app will present the post-purchase offers and to see if any issues arise. 1. Add an OCU trigger product to your Cart and then click the Checkout button. 2. If successful, you should be directed to the OCU app's checkout. You will see "/apps/secure-checkout..." in the URL bar if the OCU app's checkout launched successfully. 3. Complete payment for your checkout order. 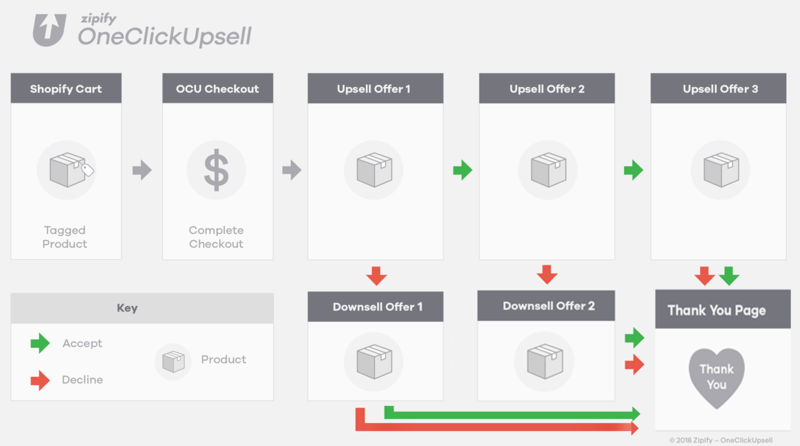 The first upsell offer page will be shown next! NOTE: It is important to make a payment of at least $0.50 (either product or shipping) for the initial checkout purchase in order to see the post-purchase upsell sequence. Otherwise, you'll be taken you right to the Thank You Page as soon as the main checkout is completed. Refunding OCU orders is a 2-step process. You can refund yourself in your payment processor (to return the funds to your card) AND in the Shopify Orders section (to keep inventory and reporting accurate) after making the live test order(s).